Most of Eritrea industrial companies in the 1950s originated during the years of Italian Eritrea, the "Colonia Primigenia" of the Kingdom of Italy. Eritrea, for its own consumer necessities, has a largely developed industry since the Italian colony's decades. Hence there is no industrial branch which is not here represented. It is therefore due to the indefatigable Italo-eritrean countrymen the very high merit of having realized that, which in the more substantial part, constitutes the Country's industrial life. Guido De Nadai created in Asmara -originally in 1937 with the name "Somalfruit"- a huge firm for financial potentiality, organizing capability, vastness of commercial and industrial activities that is now called ""Ditta Fratelli De Nadai". It has a capital of Eth. $. 2,000,000 and a annual business transaction of Eth. $. 30,000,000. The Ditta De Nadai, to which we referred elsewhere, was started in war years and particularly concerns itself with the export of vegetable products. It has branches and agencies, insofar as it concerns Africa and the Middle East, in Jeddah, Port Sudan, Khartoum, Asmara, Addis Ababa and Aden. Its seat in Italy is in Udine, wherefrom the De Nadai have origin. The organization and the development of the vegetable production in Eritrea on the post-war, is greatly due to the De Nadai. As a matter of fact it conceded to the farmers large funds, committing itself, with long-term contracts, to purchase the entire crops. This economical principle has given it own results, even superior to those hoped for. This can be ascertained also looking at the statistics which go from 1952 onward. When the firm began its activity, toward the end of 1952, the export amounted to 150-200 quintals monthly, in 1953 it jumped to 300-500 quintals monthly, the following year this amount was tripled and nowadays it has reached 7,000 quintals monthly. It is however destined to sustain a marked increase, as this clever organization can meet the exigencies of the consumers and is able to cultivate the foreign markets. Practically, this enterprise assures a regular influx of vegetable products and at accessible prices, thus sensibly augmenting the requests from all the foreign markets. Availing itself of a modern and imposing technical organization, the Firm is not forced to rely upon other organizations. It deals directly with the farmers, it works the goods within its own packings; it owns very modern freezers for the conservation of the goods for the consume markets, has an own sea-shipping agency and lastly, for the maximum part, it sells directly on the markets which it reaches with four freezer-ships with ethiopian flag, two of which of their own property: the "Giuseppina" of 600 tons and the "Donatella" of 400 tons - while the other two, one dutch and one german, are on a annual rent basis. One of the more important economical aspects of this activity is constituted by the fact that, in the vegetables' sector, Eritrea exports four times more than it imports and this with evident benefits for the Country. Another important aspect is the remarkable increase given to the vegetables' production due to which thousands of persons, even if indirectly, benefit from this activity. The Fratelli De Nadai, for their qualities of clever industrials, for their dynamism, for the passion which animates their hard and obstinate work, for the commercial honesty, for the example of accomplishing and factive laboriousness are at the foremost of all the meritorious class of italian industrials in Eritrea. It is due to the F.lli De Nadai labour - represented in Eritrea by the firm's major exponent, Mr. Guido De Nadai - the constitution of two other important societies, sprung up during this last year, with the collaboration of our countrymen: the S.A. F.lli Casciani, to which we already referred speaking of the society itself and of which we shall speak again concerning the activity of this firm in the industrial field (factory for the tomato concentrate); and the C.A.S.A. (Commercio Alimentari Societa' Anonima) which gathers the commercial activities of a well known italian exporter, Mr. Athos Cappelli, with those represented by the Ditta F.lli De Nadai, insofar as it concerns the organizing of the distribution of any alimentary product into the Ethiopian Empire and outside of the territory's borders. The society "Saline di Massawa" sprang up far away in 1905. In the last years it has undergone a radical transformation through the mechanization of all the installations. The actual production is sold inland - Eritrea and Ethiopia - and the remainder, made up of the production's main part, is exported. The principal countries to which the exports are directed are : Japan and Malaysia. Lately Kenia, Tanganika, Uganda and the Belgian Congo were added. A modern installation for purifying the salt is installed in the plant, capable of treating up to 1,000 tons daily. This salt, particularly pure and dry, is principally directed towards the japanese industries. For the forwarding of the salt destined to the export the Society avails itself of an own dock where ships of tonnage up to 13,000/14,000 tons can moor. A complete plant of conveying belts, which allows a loading speed in excess of 500 tons per hour is installed on this dock. The salt directed inland is sacked into bags which are directly manufactured in a suitable section of the establishment itself. Inland forwarding is mainly done by railway, and in the establishment there is a rational railway link. The average number of the workers is of 280/300 units. During the crop' season they increase to over 400. Among the latest accomplishments it needs to be evidenced a complete Chemical Laboratory for the daily control of both the common and the purified salt . Also, a modern automatic scale for the continuos weighing of the salt on the main conveyor belt has been installed. A further development of the salt-pools surficial extension, with a related production's increase is scheduled. On 21st April 1959, following the resolution of the Members' General Assembly, the "S.A. Cotonificio Barattolo & C." -created before WWII- became property of "S.A.I.D.E." with the purpose to give a greater impulse to the spinning, by increasing the spinning spindles actually numbering 6,912 to 12,000. Since last year the equipment included: a battery group, made up of a bale-breaking loader, a feeding carpet, an automatic loader, a small cotton opener, a vertical cotton-opener, a blowing tower with saver, a supplying blower and spreader, and a filtering battery. To these need be added: 30 "Marzoli" carding machines, 8 "Marzoli" intersecting gill boxes, 4 "Marzoli" medial sieving benches, 18 "Marzoli" spinning rings; 1 spun yarn conditioner; 22 "Marzoli" double-whisks; a scaffolding and packing group; a complete "Radaelli" air-humidifier set in the work-room; a complete 480 HP electrical power supply of the "S.A.C.I." of Bergamo. With the new developments, the necessary machinery will be fully purchased at the Ditta Marzoli of Palazzolo sull'Oglio. With this expansion, and keeping into account that which had been previously acquired in Italy, the total amount for installations and prefabricates amounts to about one half billion Lire. Besides, the Cotonificio annually imports from Italy over 100 million Lire countervalue of spare parts and hemp flock of the Snia Viscosa and these ciphers will increase while expanding. It is also foreseen that, with the expansion, over six or seven families of technicians which will come from Italy will be employed. The "Development Loan Fund" of the USA has granted S.A.I.D.E. a loan of 500,000 U.S.$. for the aforementioned spinning plant. The new spinning plant will use the hemp produced by the Cotonificio, to which it supplies the necessary raw cotton. It is foreseen an initial production of grey sheeting, white drills and white shirting which are the main types sold in Ethiopia. S.A.I.D.E. itself is a producer of cotton in a vast zone located in the neigborhood of Mersa Gulbub, 110 km from Massawa. The land exploitation started in 1958 through the soil management, with the construction of a reservoir of a capacity of four million cubic meters of water, with deviation works of a river (the Moga) for the irrigation of the caissons, with a boring installation which will reach a depth of 150 metres. Mersa Gulbub plantations were visited by H.I.M. the Emperor in January 1960. Due - as it has been mentioned - to the countrymen Casciani and De Nadai, the plant for the industrial exploiting of the tomato production cultivated in the establishment of Elaberet is fully automated. After the washing, the product is treated from the first machine which is a mincing machine, then the pulp, seeds and skin, go through a steam chamber which has the task of heating the product to a temperature of 60/70o. The successive sifter divides the slag and the seed from the pulp, which, alone, proceeds toward a refining machine and a super-refining machine. Thence, through steel pipings, the pulp reaches some large stainless steel chambers, where, through three spherical heaters it undergoes the pre-concentration and the concentration. The product remains for two hours in these chambers wherefrom it then exits, to be collected in stainless steel containers - the double concentrate. At this stage the processing of the product is over. It only remains now to put it in the automatic seam folding machines, where the cans are filled and hermetically sealed. The two canning groups, one double and one single, can each give from 30 to 40 sealed cans per minute, with an average hourly cumulative production of about 5,000 cans of different weight. As a matter of fact, in the factory cans of 100, 200, 500 and 1,000 grams are produced. The cans are successively put into sterilizing tanks, and afterward pass to the packing warehouses. A little way below the concentrate's factory, a large circular tank has been built, which has the function to serve as a gathering tank for the water used in the establishment and again convoy it, through additional pipes, to the nearby grounds. Another pipe, directly connected to the main pipe, is set at the tank's centre; while from the aesthetical viewpoint it creates a rushing water spouting, which falls back fan-like into the pool, from the practical point of view it has the precise task of stabilizing the high pressure in the pipe-work, and hence do diminish the attrition within. Born in 1945, this industry - of modest stand - for the production, in particular, of the small characteristic ceramic cups customarily used among the mid-eastern peoples and known as "finjian", developed remarkably in 1955, dedicating itself to the large scale production of "glazed sandstone (porcelain-like) mosaic-tiling" for floors and linings. In 1955 the Industria Ceramica Tabacchi, whose development is essentially due to the capability and activity of its nominee, Eng. Carlo Tabacchi, has thoroughly renewed its installations and its plant, installing italian and german machinery, which allows a daily production of 1,000 square metres of mosaic-tilings almost entirely exported also in Europe. The new installation, which required an investment of more than Eth. $. 800,000 (corresponding to 20,000,000 italian Lira) and a six months period for the installation, includes machinery for all the working cycles: crushers, grinders, drum-mills, deferrization (? - da diz. tecnico Hoeply - inesistente su dizionari inglesi) sets, dryers, presses, etc., and an oven 50 metres long. For the production of its own decorated mosaic-tilings, the plant exploits four patents of Eng. Tabacchi himself. Besides, the plant has its own quarries of kaolin, feldspathoids, quartz, etc., and produces 60% of the dyestuff necessary for its own work, importing the remainder from Italy or from Germany. The Ceramica Tabacchi produces also refractory bricks for local consume. Besides Eritrea and Ethiopia, many are the markets to which the product goes: Sudan, Kenia, Uganda, Tanganika, North and South Rhodesia, Belgian Congo, Aden, Saudi Arabia, Lebanon, Syria, Iraq, Kuwait, England, Mexico, United States. Not even the italian market is excluded, although our Country is the major producer of mosaic-tilings. The capital employed by the firm amounts to about Eth. $. 2,000,000. The annual business volume is of about Eth. $. 1,500,000. The plant's monthly productive capability is of about 27,000 square metres of mosaics and of 15,000 refractories. The raw materials making up the installations for the mosaics' production are all of Eritrean provenance. The establishment employs 15 italian workers and 400 eritrean workers. It is the continuous goal of illustrious visitors, who express the Country' satisfaction for the magnificent realizations effectuated by the Establishment. The Chief of the Government of Eritrea, HE Asfaha Woldemikael, expressed his admiration to Eng. Tabacchi with these words: "Not only I am happy, but also proud that an industry of this kind exists in Eritrea. We must thank the Lord for having here people of your stand who do good to our Country. I therefore wish you the best success." 6) S.A. INDUSTRIALE DE ROSSI FOR THE EXPLOITATION OF THE DUM PALM - COMMERCIAL SEAT IN ASMARA - PLANTS IN KEREN AND AGORDAT. It was constituted in 1912 for the exploitation of the dum palm in Eritrea. It has a social capital of Eth. $. 58,340. The employed capital is of about Eth. $. 1,000,000. It employs 6 italian workers and from 300 to 2,000 eritrean workers. From the initial commercial activity of a simple gathering of the ripe fruits, the Society has always directed itself toward a greater intensification in order to reach an integral industrial exploitation of the whole fruit, in its three constituent parts (outer shell, rind and nut) as well as the utilization of its residuals and by-products. The monthly production, which is of about 12,000-15,000 large grosses or bulks of 1,800 pieces each, is absorbed for the 80% by the button manufacturers of the U.K. and the remaining 20% by other markets. Keren's plant is erected on a property land area of 111,000 square metres, in the industrial zone, with railway link and dwellings for workers and clerks. It has an own electrical power plant, with a 250 HP diesel Man engine, a 120 HP Tosi engine and two DEUTZ engines respectively of 75 and 30 HP, besides a 250 HP steam engine and driver. It has all the industrial equipment to work the button, from the raw material to the finished packed product; saw mill, marking, crimping, drilling, polishing, selection, packing, transportation, capable of exceeding the limits above mentioned. Besides, it has all the equipment necessary to the functional maintenance of an establishment of such size and distant from supplying centres: joinery, mechanical workshops, foundries, precision tools, etc. Agordat's establishment is erected on a property area of 41,000 square metres in the industrial zone and it includes, besides the plant itself, dwellings for workers and clerks' use. In the plants proximity also a railway link is installed. Its industrial complex comprises a mechanized sawing mill capable of producing over 2,000 q of sawn material monthly; as well as a plant for grinding the dum nut processing's residuals employed for the extraction of oil for soap, with a monthly production of 3,500 q. It has its own electrical power plant made up of two steam engines for a total of 260 HP and a 110 HP diesel engine. Due to new agreements undertaken by the society, it is held that the Plant's development will grow in the next year, having the product found selling possibilities in various other markets and above all in the italian market. It is part, as we have already mentioned, of the Enterprises which carry out a type of activity related to agriculture. We do hereby give some data on the entity of the Society, whose sole administrator is the countryman Tullio Camerino. This Society, born in 1951, deserves mention as an example of will and firmness of an enterprise which, in the past, many have attempted and abandoned: that of the exploiting of the leaf of the Dum palm for the production of textile fibers. Attempts to exploit this leaf - which flourishes spontaneously in Eritrea, Somalia and Sudan - were done, since this century's first years and repeated every once in a while until 1950, but then abandoned by all for the absolute impossibility, met with until thence, to obtain a profitable economical production. The D.U.M.C.O. at once dedicated its own attention to the construction of stripping machinery which could adapt to the particular nature and shape of the Dum leaves and continued its own studies in this direction, notwithstanding the decidedly negative opinion of many specialized firms, among which a subsidiary society of KRUPP. To day, after years of experimentation, modifications and improvements which are still being carried out, the D.U.M.C.O. has a complete installation of machines for the stripping, washing, bleaching, cleaning and packing of the fibre which allows it a monthly production of 800 q, until now absorbed by the sack factories of Addis Ababa. The results attained by the D.U.M.C.O. allow Ethiopia a large saving of currency for the import of textile fibers for its own sack factories. Besides, differently from the other local productions, the D.U.M.C.O. has a price inferior to that of the imported fibres. Given the particular characteristics of its work, the D.U.M.C.O. employs almost exclusively eritrean workmanship - from 300 to 400 workers - and two italian technicians. For the mentioned exploitation of the textile fibers produced by the D.U.M.C.O., a new society named "Manifattura Sacchi Asmara" has been recently formed whose task will be the transformation of the fibres into the finished product, namely packing canvases, sacking items, etc. This new society will have a capital of Eth. $. 1,250,000 and, separately, will avail itself of a financing already obtained by the "Development Bank" of Addis Ababa, of Eth. $. 800,000. With the new installations the Society will face the needs of packaging sacks of Eritrea and it will be in a condition to vie with the need of all the other parts of the Ethiopian Empire. Melotti establishments sprang up in 1939 due to the initiative and the unusual cleverness and tenacity gifts of the late Eng. Luigi Melotti who, of the imposing industrial establishment, has been the creator. The plants' surface is of 100,000 square metres, 25,000 of which covered by modern and functional buildings. The industrial activity includes: the distillery, the liquor factory, the brewery, the glass factory. LIQUORS FACTORY: the liquors' production has been, in the main, directed toward those qualities which find easy sale with the ethiopian consumer, and the Melotti Liquor Factory markets several kinds of liquors particularly appreciated by the clientele. The productive capability is of about 50,000 bottles monthly. The liquors most requested are: Anise - Cognac - Fernet - Gin - Zibib. BREWERY: Born during the war period in order to satisfy contingent necessities, under the impulse of the Eng. Luigi Melotti, initially, and of the widow Mrs. Emma Santini Melotti, later, the beer industry has constantly directed its own efforts to satisfy the market's exigency, both concerning the product's quality as well as the price. This program forces her to update continuously her installations. The product is appreciated in all the country and even abroad where only currency difficulties limit her already flourishing export course. The annual productive capability is of about 500,000 hectolitres of beer. The necessary raw material for producing the beer is for 90% of local production, as the Melotti Establishments avail themselves of a malting installation where exclusively ethiopian barley is employed. Concluding, the Melotti Industry is flourishing and the proprietors' work is constantly tended to continually increase the firms activity. In the Melotti Establishments 18 italians and 170 ethiopians are employed. SAVA GLASS FACTORY:The glass factory started, in a vaster way, its own production in the month of January 1960 with the new installations which, emplaced in 1959, will allow a production which extends from the 90 gr bottle to the 1000 gr bottle and to a vast range of glasses, which will meet a favorable and satisfying setting in all the local markets. Works for a very modern installation for decorations are also under way, which will enter the production phase the next month of September: with the mentioned installation the most disparate sayings and multicolored decorations will be printable on the glass products. The factory complex avails itself of its own electrical power supply where several electrical assemblies for a total of about 1,200 HP are installed. The said power supply is indispensable for the firm's production, as even the least interruption of the electrical energy would jeopardise the good course of the production. HE the representative of H.I.M. the Emperor visited, on March 19, 1960, the plant, taking a keen interest to the activity of the praiseworthy Ditta Melotti. Born in Eritrea in 1936, the society produces wines and liquors, with a range of numerous types which have met a wide success in Eritrea and in Ethiopia. The social capital is of Eth. $. 300,000; the business' yearly volume is of about Eth. $. 360,000. The principal raw materials are imported from Italy, especially concerning those necessary to prepare beverages of italian type. Due to the achieved importance, the Ditta Fenili has purchased the real estate property of the S.A. Michelin Italiana, at n. 11, Menelik II St. (ex Oriani St.), where the two sections which headed the firm have been grouped; that of manufacturing and selling, formerly in Pisacane St.; and that of production, that is of fermentation of the grapes and of the musts with the successive processing and the liquor plant, previously installed in Randaccio St. The expense for the new installation amounted to about Eth. $. 15,000. The firm was born in 1941 in order to face the local exigencies caused by the war period, so as to supply autarkic wine on the local market. (In that period eritrean fruits were utilized). Successively raisin was introduced in Eritrea from Yemen, which allowed to perfect and improve the wine's production. When it became possible to reconnect the commercial relations with Italy (1948), Mr. Vitale imported the italian concentrated musts, so as to try to produce the italian wine in Eritrea. The factory actually manufactures on a large scale the "Cognac Vitale" and various aperitifs which are well appraised in Eritrea, Ethiopia and Djibouti. The Society has own buildings in Asmara. Recently it opened a liquors' factory also in Addis Ababa. It gives work to 6 national dependents and 13 eritrean workers. The firm is representative also of many italian firms, for various products which find a setting in Eritrea. The Society sprang up in 1943. Actually it is property of the countrymen Cherubini and Guerini heirs. It is located in Kalu' St., in a rented building. It supplies wines, liquors and syrups, with a monthly production of 30 hectolitres of wine, 25-30 hectolitres of various liquors and 10-12 hectoliters of syrups. The products, obtained from raisin from Yemen and from italian concentrated musts, is absorbed by the local market (Eritrea and Ethiopia). It employs 4 national workers and 15 eritrean workers. The annual business volume is of about Eth. $.300,000-320,000. Property of the countryman Giovanni Rusin: the firm was founded in 1936. It produces various aperitifs, Cognac, Gin, Rum and an assortment of 40 types of liquors. Supplied with an equipment which could develop a production volume of 150,000 bottles yearly, the Firm produces an average of 50,000 bottles, for an annual business value of about Eth. $. 180,000. The products are sold exclusively in the Ethiopian Empire through Agencies, Representatives and Brokers in the territory's principal centres. With social seat in Torino, the society sprang up in 1936; it avails itself of an establishment in Asmara for bottling the spring waters of the Citone and Eletta Mareb, both situated at the springs of the Mareb River, at about 30 km from Asmara. In this establishment, besides the bottling of mineral springs' waters, also various soft-drinks (like orangeades, lemonades, gassosa, orengo, china cola, garda soda, colarom etc.) are produced, whose processing is done with fruits' pastes and choice syrups. Through a new and modern installation, equipped of all the sanitary and hygienic prerequisites, the bottles go through several washings with lukewarm water and finally rinsed with flowing water. Then they are sent to the bottles filling, which is automatic. Actually 9,000 bottles of water and 2,500 of soft-drinks are bottled and distributed daily; but the factory's capability, due to the new equipment installed about six months ago, is of 15,000 bottles of water and 10,000 bottles of soft-drinks daily. Being ascertained the fact that the capacity of the springs is unexhaustible, the plant, with the available installation, might greatly increase the production. The compound, where 75 workers are employed, avails itself also of the services of three tanker-trucks and seven vehicles for domicile distribution. The Society's business volume is of about 25,000,000 italian Lira. Actually the society has stipulated an agreement with other two similar Societies which are managing the springs of Dongollo and Ailet, so as to face more easily the economical crisis which the Country is undergoing, thus forming the U.V.A.M.S. On August 3rd the Society was visited by HE the Chief of Government of Eritrea who expressed his hearty praise to the general manager, Count Berzetti of Buronzo. Founded in 1943, it has an annual capital of Eth. $. 150,000. The establishment is situated in the Campo Polo zone, on 4,000 sq m of owned land. On this lot are erected the buildings of the plant, absorption tower, cooling coils, gas meter, warehouse and coal deposit, workers' housing, health premises, workshops and garage. The plant produces carbon dioxide (C02), for alimentary use. The CO2 gas is produced by a completely electrified absorption installation based of the Shultz system. The product is sold both in the internal market as well as in that of Saudi Arabia. The firm's activity started in 1936. Nowadays it avails itself of a capital of over Eth. $. 1,000,000 represented by immovable property, machineries, reserves, manufactured goods, etc. The yearly business value is calculated on the average from Eth. $. 500,000 to 600,000. The firm exports weighing balances, brick moulding presses and any other iron work requested. The markets toward which it directs its own products are Aden, Saudi Arabia and Sudan, besides the internal markets of Eritrea and Ethiopia. The usual number of the italian employees of the firm is of 20, while that of the eritrean workers reaches 50. As we pointed out in another part of the report, the firm undertook from the Government the important tender for the construction of the dam at Zula for a value of Eth. $. 1,700,000. The works, started the past year, have been visited on January 15, 1960, by the Emperor, who deeply interested himself concerning the general progress of the whole work. It is a serious firm created just before the start of WWII, technically equipped for works of large size. To this workshop is due the emplacement of whole installations and the construction of the machineries of many local industries (Tabacchi Factory, various installations for the salt plants of Massawa and Assab; installations for aqueducts, etc.). In the last period the Firm affirmed itself in the ethiopian market for the construction of barges and patrol vessels, which have been put to use for the fast transport of motor vehicles from Bahr Dar and Gorgora', on the Tana lake. It has a moderate compound which engages four native workers. The owner started his activity on his own during the current year. Able person, he has the maintenance task of the engines of Assab's aqueduct. His primary activity however is in the field of road transports. It is composed of a large compound situated in the field which encloses the restaurant and the hotel. Mr. Desideri is the manager of the "Shell" gas station besides being the owner of a well supplied store for vehicles' spare parts and miscellaneous. He employs 5 italians and 7 natives. The workshop is equipped with two lathes, one drilling machine, one welder, a grinder and a good supply of tools. Beginning of the S.E.D.A.O. activity: 1st February 1936. Activity: production and distribution of the electrical energy in Asmara - Massawa - Ghinda - Nefasit - Embatkalla - Dongollo - Mai Habar. Social Capital: Eth. $. 1,400,000. Annual production: about 22,000,000 kw/hr. Installations: a) Thermoelectrical power stations of Asmara - Massawa Gerar - Massawa North - Massawa West, with 21 thermoelectrical groups for a total power of 12,694 HP. b) Dorfu' I and Dorfu' II hydroelectric power stations, with n. 4 turbines for a total of 22,000 HP. Italian dependents employed: on the average n. 130. Eritrean dependents employed: on the average n. 650. The S.E.D.A.O. took over the installations of the Azienda Elettrica Governatoriale dell'Eritrea in 1936, engaging itself to bring them, within a short time, to the necessary degree of efficiency and to increase their potentiality. This being an all but easy task, given the incumbent heap of unfavorable circumstances, such as: the precarious condition of the inherited industrial complex, the sudden and rapid increase of the population, and the consequent development of the various commercial and industrial activities of the Colony. The influence zones to which the Society had to assure the supply of the electrical energy included the two main centres of Eritrea: Asmara and Massawa, as well as the other minor ones situated along the roadway connecting them: Dogali, Ghinda, Embatkalla and Nefasit. The production plants were three: two thermal, Massawa and Asmara; the third, named "of Dorfu'", hydraulic. Leaving out the diverse phases with which the enlargement of the installations came about, the power set up in the thermal installation has actually reached 15,000 HP and the energy production has risen to 22,000,000 kw yearly. This result has been reached, besides providing to the installation of new generators, by enlarging the production power plants, building new transformers' cabins, renewing and developing the distribution networks, laying down high voltage cables both in the sea and on the land and to the completing of the high voltage line (50,000 volt) which links the power plant of Massawa with that of Asmara. Also, the remarkable extent of the S.E.D.A.O. complex, the marked diversity of climate and of elevation of the zones concerned, have issued some fundamental questions, specially in respect of the thermoelectrical power plants, which have been studied and solved in a satisfactory way since the first years of existence of the society. This important mass of work is mirrored, partly, by the growth reported in the following list: 1936 1958 Generators installed in the power plants HP 1,750 15,000 Transformers installed in the power plants KVA 1,800 13,750 Transformers' cabins n. 16 143 Transformers in the above mentioned cabins KVA 955 14,000 Length of the high voltage lines km 110 200 High voltage cables km 0.500 2.200 Length of low voltage lines km 14 101 Voltage of the electrical line Massawa-Asmara Volt 25,000 50,000 Voltage of the power supply line Volt 3,200 5,440/3,200 Voltage of the power distribution line Volt 220/127 220/127 Frequency cps 50 50 As for what concerns the hydroelectric installations, the work carried out and actuated by the S.E.D.A.O. ended with a gathering of water, and resultant production of electrical energy, more than tripled. The first and so far only hydroelectric installation arisen in Eritrea, that of Belesa-Dorfu', as a matter of fact utilized a modest collecting basin situated along the eastern edge of the highland and constituted by an extension of land whose valleys were obstructed by earth dams thus creating the artificial basins of Belesa and Valle Gnecchi for a total capacity of 2,000,000 m3. This was, in reality, the hydroelectric installation built by the Government of Eritrea in 1919-1920 and given in grant to the S.E.D.A.O in 1936 together with the rudimentary thermoelectrical installations then extant. The extension of the collecting basins of Belesa and Valle Gnecchi was however so small and the hydrological efficiency so low that the hydroelectric installation not only was of no efficacious service for the production of electrical energy but it also resulted as of a relatively burdensome management. In these conditions of precariousness S.E.D.A.O. quite soon decided to procure for itself other water by artificially extending the above mentioned basins and by creating other basins of a greater capacity. Hence S.E.D.A.O. thoroughly faced the actuation of a new program in respect of which, from the first months of 1940, damming works for the "Toccor" stream were started in the vicinity of the village of Addi Shiaca', for the creation of the homonymous lake of a capacity of more than 5,000,000 m3. The above mentioned works, forcedly withheld following the war vicissitudes, were fully taken up again in 1953 and by now they have been terminated. Among the works of recent accomplishment are to be pointed out, in particular, the doubling of the forced conduits of the hydroelectric power plants Dorfu' I and Dorfu' II, and the building of the new large Dorfu' road as well as the enlargement and arrangement of the preexistent road. The important complex of works of the Eritrean Relief, built by S.E.D.A.O., not only constitutes a noteworthy increase of electrical energy, but moreover also a fundamental backing to the hydric supply of the population of the city of Asmara. The amounts which have been exposed in the present short memorial give only a partial idea of the efforts which S.E.D.A.O. has fulfilled in 23 years of activity, overcoming difficulties of all kinds, so as to warrant the important and essential services with which it has been entrusted. All in all the S.E.D.A.O. 's investments in Eritrea correspond to about Eth. $. 10,000,000, of which about Eth. $. 3,000,000 represent the amount of the new installations and of the works carried out after September 15, 1952, whose implementation - as to 31 December 1959 - has required over one million working days. Ii was constituted in 1935 in Rome with the purpose to execute all the constructions of electrical installations in the Ethiopian Empire. All the larger italian electrical Societies have contributed to form the Company, among which the Idroelettrica Piemontese, the Edison Volta, the Adriatica di Elettricita', the Centrale e Meridionale di Elettricita'. Since 1936 the "C.O.N.I.E.L. ", having obtained agency to act in the Empire in its own specific activity, established itself in all the most important centres of Ethiopia and Eritrea, except Massawa and Asmara where, already before 1935, the S.E.D.A.O. was active, carrying out some installations of small thermoelectrical plants, while at the same time a projects office carried out the projects for the large hydroelectric power plants. On May 1940 the studies and the projects were completed, among which that of the Awash of the power of 40,000 HP, to supply electrical energy, besides Addis Ababa, also to Dire Dawa and Harar, and it would have given the possibility to irrigate and make fertile the vast plain which from the collecting basin goes toward the Arussi. The C.O.N.I.E.L. accomplished, finishing it in a record time, the hydroelectric plant of Akaki, so as to meet without delay Addis Ababa always increasing energy requirements. Akaki's hydroelectric plant, together with the thermoelectrical, have supplied up to the present day the necessary energy to Addis Ababa, while the Awash project is actually being carried out by the "Societa' Imprese Italiane all'Estero" (IMPRESIT), a work which will be executed as an account for reparation payment from Italy to Ethiopia. The intervened war events did not allow the execution of the large projects of the "Salto del Gallo" at Dessie', of Falaga at Gondar and of the Mai Nehafit in Eritrea. The last one could have supplied all the eritrean centres with the energy to them necessary and guarantee to the town of Asmara a large quantity of potable water in any period of the year. During the British occupation the C.O.N.I.E.L. improved the installations which had been effectuated on a provisional basis; those in Ethiopia were taken over by the Ethiopian Government as war booty. The eritrean plants, Decamehare and Adi Ugri (electrical energy and aqueducts) Keren, Adi Caieh and Adi Qwala (Electric Energy) have been enhanced due to the inflow of italians evacuated from Ethiopia in the following measure: Decamehare n. 1 electrical generating set total power HP 1,400 Adi Ugri " 4 "650 Keren " 4 " 500 Adi Caieh " 2 " 100 Adi Qwala " 3 " 120 This power is still installed in the various plants, but, while during the period of italian overpopulation it was hardly sufficient to satisfy the energy request, after the italian population repatriation it became exuberant, creating for the C.O.N.I.E.L. a rather difficult economical situation. The difficult position greatly increased in 1952 when the production costs started to increase - and they are still increasing nowadays - without having been able to obtain from the Government a readjustment of the cost rates of the electrical energy. The C.O.N.I.E.L annually supplies 850,000 kw which represent a fourteenth part of the amount absorbed by Massawa and Asmara, where nevertheless there is some prosperity in respect to the five centres supplied by the C.O.N.I.E.L. which suffer for a increasingly preoccupying economy. The activity goes back to before the last world war. The establishment is actually property of Avv. Bevilacqua. It heads three different industries, represented by an electrical power plant, an ice factory and the aqueduct. The electrical plant supplies normal and industrial electricity to all the zone of Agordat. The ice factory limits the production to the necessities of the same zone, inasmuch as the aqueduct supplies water to the same territory. The utility of the three industries is of notable solace to the not few countrymen who live or gravitate in the Western Lowlands for work purposes. The personnel in charge of the three establishments is made up of two italian and nine eritrean workers. CENTRALE ELETTRICA IGAZIO SAVOCA - ASSAB It is the most important complex of this sector, in Assab. It employs three national workers and ten eritreans. The plant supplies to the town the electrical energy for both domestic and industrial use. The installation is made up of two 200 HP engines, three of 100 HP, and (? manca definizione nel testo originale: numero) 300 HP and produces an annual average of 1,000,000 kw. A financially solid firm, with the probability of an additional development. The proprietor, an individual well introduced in the eritrean and ethiopian environments, is a serious and able person. Sole manager of this society is the countryman geom. Mario Venturi. It actually operates in the mining centres of Ugaro' and Damishoba'. It owns a social capital of Eth. $ 14,000, while the employed capital amounts to Eth. $. 300,000. The Society has available large installations for the treatment of the minerals, by way of ores fracturing, grinding and cyanide processing sections. The data concerning the ores treated in 1957 can thus be summarized: 15,804.758 tons of mineral have been crushed and an equal amount has been ground while 12,167 tons of sands have undergone cyanide processing. In 1958 the mineral treated has increased: grinding has reached 16,197.5 tons while cyanide processing reached 14,694 tons. The production for the year 1959 has been the following: amalgam 251,684 gr; muds 487,000 gr; washed slags 3,851 gr; gold obtained (average 23 carats) 124,959.340 gr; silver (400/1000) 2,975 gr. Instead in 1958 the production reached the following results: amalgam 253.626 gr; muds 768,000; slags 3,498.3; gold obtained (22/23 carats) gr. 140,944.77; silver obtained (480/1000) 3,610 gr. The employed manpower - managers, technicians, clerks, mechanics, miners and labourers - is of about 200 dependents The society has available also a thermoelectrical power plant, a pneumatic set, an hydric set and a well equipped mechanical workshop run by electricity. The works carried out in the mine from January 1st to December 31st 1950 are the following: a) Underground works 1 - Opening of a section of heading 33 m long , uniting heading n. 4 with the exterior in a raised position in respect of the river. This heading, executed completely in the muck, became necessary in order to assure a safe outlet to the exterior for the underground works. 2 - Opening sections of heading underneath the river so as to unite the underground left working site with the right working site. 3 - Closing of the outlets to the exterior of headings n. 4 and n. 5, both at river's level, in order to avoid floodings of the underground working sites. 4 - Opening of the crosscut bank n. 3 - long 97 m - linking headings n. 5 and n. 2. 5 - Prolongation of heading n. 6 for a length of 40 m so as to link heading n. 4 with pit n. 1. This link has not yet taken place and it will be completed within the current year. 6 - Prolongation of headings n. 4 - 5 - 1 - 2. 7 - Deepening of pits n. 1 and 2. 8 - Opening of drainage channels for water's natural fall. b) Works in the open 1 - Completion of the three-way raising installation. 2 - Building of 1 silo placed on the bedding's head. 3 - Building of the washing plant. 4 - Building of the raising installation on pit n. 1. 5 - Setting of the electrical line between the raising work site and pits n. 1 and 2. 6 - Installation of an electrical pump into pit n.1 and into pit n. 2. c) Stoping works No stoping work has been carried out during all of 1959, also because, due to the easy self-ignition of lignite, it was not possible to store it externally. In the mine 50 persons are constantly employed. As it can be seen, it is an establishment of a serious and of secure future, which owns its own origin to the work done in East Africa by the Italian Administration through the properly qualified organization, then named A.M.A.O. (Azienda Miniere Africa Orientale). The activity was born in January 1946 with the purpose to exploit the gold deposits in Ducambia. The grinding installation is composed of a Frazer battery with 5 stampers of 500 kg, activated by a naphta "Diesel" engine. The cyanide processing section in made up of 6 cyanidation vats of 19 m3 each and it is supplied with other subsidiary vats and by a pool for gold precipitates. In the establishment there is a building for the owner's own dwelling with lodging for the nationals there employed; there is also one hangar for the storage of the equipment and of the engines; one mechanical workshop, several stores and a foundry chamber. The average monthly production of gold is of about three kg. The plant employs a national and 120 native workers. The grant comprises: a) The salt field (sodium chloride) for a total of 145 ha situated in the Salt Plain (Danakil Depression), Assale' zone (Karum - Bad Halaila - Colulli) at about 115 km from the truck roadway from Mersa Fatma (on the bay of Hauakil). b) Manganese mineral deposits for an area of 10 ha, situated in the Greun Inkafela' zone (to the south west beyond the Salt Plain) at about 20 km from Assale'. c) Beryllium - the grant besides includes a deposit of this mineral for a total of 300 ha in the Barale' zone (to the south west beyond the Salt Plain) at about 35 km, air line, from Assale'. This deposit is however subjected to further technical studies to be carried out in site, as the analyses so far carried out on the collected samples have given a yield of beryllium contents to low and as such not economical. The deposit can be considered as almost inexhaustible given the huge extension of the Salt Plain (6,000 sq km) and given the annual continuous and spontaneous reproduction of new salt crusts, along almost all the surface of the plain itself, with the inflowing of the waters coming from the seasonal rains in the highlands. The product is optimum, of a snowy white color, almost perfect due to its low contents of impurities. It is packed into jute bags (each of 50 kg) so as to ease its handling. The salt of the Danakil region is greatly sought for by the people of the ethiopian hinterland and it is preferred to the salt of marine production. The yearly salt's consume for feeding and for industrial use in the Ethiopian territory is of about 50,000 tons. Actually the production work in the salt mine is done exclusively by the manual system, that is, without any mechanical equipment. The transportation from the salt mine to Mersa Fatma is carried out by means of trucks. From Mersa Fatma the salt is forwarded to Ethiopia through the harbors of Massawa, Assab and Djibouti, with small vessels of a maximum tonnage of 100/120 tons, because in the Mersa Fatma bay the depth is not suitable for larger vessels. The deposit, quantitatively, is not very important ( although it has not yet been possible to effectuate an appropriate evaluation). As a matter of fact it has been roughly evaluated to only 45,000/50,000 tons of mineral. However it appears as qualitatively very interesting. Many analyses carried out on samples collected in the deposit have given an average contents of 51% of manganese. Actually the in the Inkafela' deposit the production work is carried out, as well as for the salt mine, exclusively with the manual system and therefore without any mechanical equipment. The daily production is of about 400 q. Nowadays about 120 local workers are employed and about ten eritreans (drivers, helpers, mechanics, carpenters). The italians are, presently, 8: a manager, an accountant, a miner and 5 drivers. For the transport of Inkafela's minerals to Mersa Fatma, heavy lorries with trailers (Fiat 634 - OM - Titano) are used, actually in the number of six. From Mersa Fatma the mineral is transported to Massawa by two vessels (100 and 140 tons) on weekly service. The mineral of manganese has been sold in the United States and in Holland and in Massawa 4,000 tons are awaiting embarkation for the above mentioned destinations. During the first three days of the month of January of the current year, a first lot of 500 tons has been shipped, directed to Holland. Although in the S.A. A.M.A.P. - share capital Eth. $. 500,000 - ethiopian capitalists are presently interested in the measure of 51%, the establishment represents an essentially italian activity, because wholly italian were its origins and italian is its actual technical management. As a matter of fact the A.M.A.P. plant sprang up in 1943 under the name of I.F.M.A. - Industria Fiammiferi Maderni - Asmara - and started its own production of matches in 1944 and that of paper in 1947, production which as of now still continues under the technical supervision of the brothers Eng. Aldo and Nico Maderni. Both in one, as well as in the other field of production, the first machineries were planned and constructed in Eritrea. In the matches' section the A.M.A.P. has today a productive capability of 250,000 boxes daily, but an effective production of about 50,000 boxes, production which is absorbed partly by the eritrean market which has an average monthly consume of 400,000 boxes while for the remainder it is sent to Ethiopia and exported to Somalia now under the Italian Fiduciary Administration. The processing of the A.M.A.P. 's matches is only partially mechanical and this so as to avoid, like for other industries, to reduce too much the employment of manpower. Manual are the framing operations for the application of the matches' ignitable head and those of packing into boxes; mechanical those of exfoliation of the stalks and cutting of the splinters. In the paper factory section, the A.M.A.P. essentially produces wrapping paper of the yellow and gray types, in the measure of 50 q daily, production absorbed by the Eritrean and Ethiopian markets. For the production of the yellow paper the A.M.A.P. utilizes wheat chaff, while for the grey type it exploits the dry leaves of the dum palm which contain a high percentage of cellulose. Given the great abundance of the raw material - dum palm and other spontaneous vegetation - the A.M.A.P. has also in schedule the production of cellulose for other uses. Situated in a very vast plot of land at the outskirts of Asmara, with large buildings, the A.M.A.P. has departments of mechanical workshop and of joinery for labels and printed materials. The eritrean manpower employed exceeds 300 units. Important innovations have taken place in the establishment during the year 1959. They are the following: a) - The execution of the connection, by way of a 150 mm pipe line, from the lake of Acria Superior with the paper factory, along a stretch of about 5 km which conveys, by gravity fall, the lake's water to the factory's workplace. It is a work of large import which largely warrants the paper factory's water needs, also in relation to all the foreseeable future developments. b) - The acquisition of the full ethiopian market insofar as it concerns the matches supply. As a matter of fact, imports of matches from abroad have been closed since about two years and since six months every other internal production has given up. Consequently A.M.A.P. 's daily production has increased from 40.000 to 60.000 boxes and it is foreseen that it will reach 100.000 boxes; that which, in any case, represents half of the matches factory's productive capability, which therefore still preserves large possibilities for the export markets. In the morning of April 8, 1960, HE the representative of H.I.M. has visited the establishments of the African Match and Paper, with a keen self interest to the production's progresses which by now supplies the full need of Ethiopia and showing to the managers his satisfaction for the achieved results. The setting up of a paper factory was decided upon, so as to provide to the lack of packing paper and cardboard, in 1941. The establishment is located at east Medri Zien-Carneshim and more properly at the 13th km on the Asmara-Keren road, with a further stretch of 3.5 km of dirt road on the left of the above mentioned roadway. The establishment is made up of two mullers, one beating engine, a (macchina in tondo ?? ) Fourdrinier machine for the production of paper, one calender, one press, one hammer for the drawing up of the paper, one wet splitting machine for cardboard and other various machineries, all actioned by several electrical engines working through the SEDAO electrical power network. The necessary - and for the factory vital - water, is pumped from a small artificial lake with perennial water 400 m away and with an elevation of 35 m. All the machinery, during the first periods of the occupation, when it was not possible to import from Europe, was planned and built by the brothers Federico and G. Battista Perrone in the workshop located in Decamehare. Afterward, the imports from Europe started and part of this machinery was substituted and perfected with original parts. The producing capability is of 250 q of paper and cardboard monthly but, due to the local competition and the imports, the said production is reduced to about 180 q monthly. The factory produces; gray paper, chaff paper and cardboard and the product is sold solely in the eritrean market. The workmanship, composed by eritreans only, is of 29 persons who live with their families in the vicinity of the establishment. Other 25 eritrean workers are employed in the establishment located in Asmara, Edaga Hamus zone, where packing boxes, disparate alvearies for eggs packaging, small bags, etc. are produced. The raw material for the production is made up of scrap paper and straw. The annual business volume is of about Eth. $. 120,000. The employed capital is of about Eth. $. 30,000. The factory of Medri Zien is situated on demesne land, where, at the times of the Italian Government, a gold mine of the A.M.A.O. was existing, while that where the boxes are manufactured in Asmara - Edaga Hamus, covering a surface of 3,000 sq m, with about 1,000 sq m covered, is property of the Fratelli Perrone. The beginning of the activity goes back to 1950. The factory produces only a type of brownish packaging paper. The product is sold entirely in Eritrea. The capital employed is of about Eth. $. 20,000, inclusive of the value of the building, machineries and of the various equipment. The annual business value reaches Eth. $. 50,000. The actual activity, of an artisan character, is appreciated on the market, where the product meets the consumers' favour. The firm employs 15 eritrean dependents. The society, under the denomination of S.N.E.D.A. 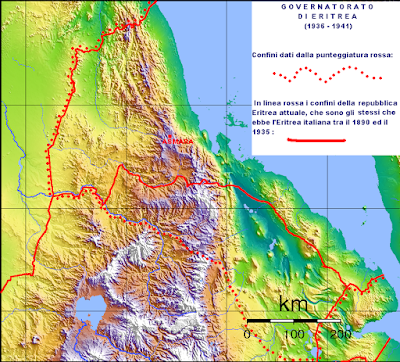 (SOCIETE' NATIONALE ETIOPIENNE DEVELOPEMENT AGRICULTURE) effectively is an issuing of the Fratelli Tosca of Castel San Giovanni (Piacenza) and has a capital of Eth. $. 1,200,000. It has been constituted to manage for itself and for third parties, the cleansing of the cereals, of dry pulses and oily seeds, and releases the impurity certificates requested for the export of the mentioned commodities. The Society has seven installations in the ethiopian territory, two of which in Eritrea, in Asmara and Assab. The establishment of Asmara, situated on the road to Massawa and linked to the eritrean railways, has very modern installations - italian - and can process up to 1,000 q daily, employing, in the period of activity - which goes from November to February/March, over 50 eritrean workers, managed by italian personnel. The S.N.E.D.A. establishment in Assab has a producing capability of 700 q daily, with the employment of about 30 workers. The Fratelli Tosca are well known for their milling installations in various centres of Ethiopia. In Eritrea they operate with the Decamehare's establishment which can produce up to 200 q of corn flour daily. 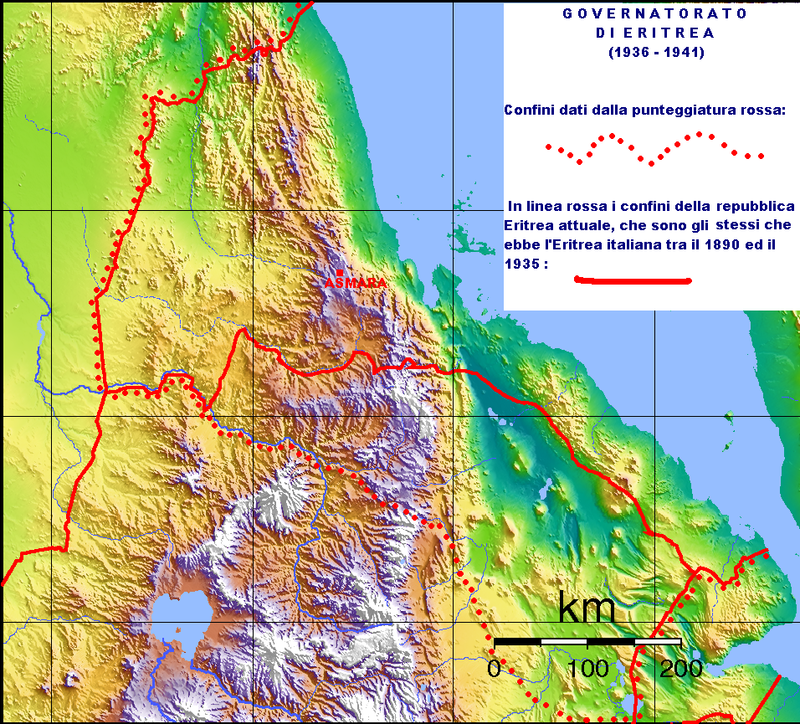 The society was constituted in 1914 with italian capital. Actually the shares are all in possession of our countrymen. It produces all types of corn flour and common and egg alimentary paste. It has availability of all machineries, a cylinder-mill with 12 rounds and a pasta factory with three continuous presses. It employs ten italian clerks and workers and 50 eritrean workers. The product is entirely absorbed by the eritrean market. The annual business volume is of about Eth. $.1,200,000. The construction of the cylinder mill was done in the year 1900 by the Knight of Labour Giuseppe Vaudetto. The installation supplied all the eritrean needs until 1935. The firm employs a currency capital of Eth. $. 150,000 in order to supply itself of raw materials in the italian markets. It employs about 20 workers, italians and eritreans. The production might easily exceed 400 tons of flour monthly, but it is reduced due to the competition of the flours which flow in from the Addis Ababa market. The industrial activity of the Ditta Molinari includes a large variety of products and machineries. In the working place - nearby modern machinery for the production of grit (Molinari has own marble quarries in Eritrea), for cement and sand mixing, for the manufacture of tiles, their polishing, and many other works - still to be seen, and at times also used, are machineries built locally during the war period and planned by Molinari himself: witness of an ingenuity and of a working will which does not surrender in front of obstacles and which as a matter of fact are a characteristic of the Italians' work in Eritrea. Virginio Molinari, with his own slogan "everything with cement" has used cement for the most disparate works, from the common tile for the footpaths to those decorated with a coating thickness of coloured marble; from modest sinks to great tanks, from small, large and enormous pipes, to the bellied wine vats; from the benches widespread in the public gardens to the monumental fountains; from the Doric, Ionic and Corinthian capitals to the prefabricated elements for reinforced concrete ceilings. The firm sprang up a few years ago and, contrarily to the others of the same kind, which are all artisan-based, with production of bricks and hollow bricks, it is on a developing trend on an industrial base, with the purchase of a brick moulding machine of the Officine Reggiane costing about 5,000,000 italian Lira capable of producing 4,000 gasified bricks per hour. The purchase has been determined for the purpose of diminishing the production cost and to provide a reserve for the rainy period , when the excavation is not possible. The firm avails itself of a Hoffmann kiln with aspirators. The baking capability reaches 300,000 bricks monthly. The employed manpower is of about seventy eritrean workers. Formed in 1900, it actually has a 20 years contract with the Eritrean Government for the operation and the management of Massawa's plant, having renounced in favour of the said government, to the installations of its own property. It has a social capital of Eth. $. 84,500 and an employed capital of Eth. $. 250,000. It employs about twenty workers, eritrean and italians. It is the best equipped ice factory of Eritrea. The mechanical implements utilized can be so summarized: n.2 compressor and ammonia installations; installation by ammonia expansion for the freezer cells; vapor installation, vaporizers and machineries for the production of distilled water, electrical motors and technical equipment for the three productions. FABBRICA DI GHIACCIO - CIGNANI ORLANDO - ASSAB It is the only ice plant existing in Assab. With an efficient and quite modern equipment, it started its activity in 1955. The countrymen Cignani owns the building and the land where the plant stands. The dependent workers are three natives. The proprietor is a hard working, able and esteemed person. FABBRICA DI GHIACCIO - LUCIO CABIATI - ASMARA Installed in a property building, the plant is made up of seven freezer cells capable of producing 50 q of ice daily. The daily normal production is of about 10-15 q which is almost completely absorbed by the American Command of the Kagnew Station. FABBRICA DI GHIACCIO - EMANUELE CINNIRELLA - ASMARA A well equipped firm, availing itself of such means such as to produce over 100 q of ice daily, through moulds of the size of 25 kg. Actually it reduced the production due to the crisis that this industrial sector in particular is going through. The proprietor has available a property building for the plant. FABBRICA DI GHIACCIO - RICCARDO FRANCESCATO - ASMARA It is a plant of modest potentiality, which can produce a maximum of 25 q of ice daily. The actual production, for those reasons already hinted at concerning the particular crisis of this industry, does not exceed 2 q of ice daily. The product is made with moulds of 25 kg. The plant is located in a leased building, property of the S.A. FIAT of Torino. FABBRICA DI GHIACCIO - COLONGO & TONNELLOTTO - ASMARA Located in a building of property of the firm itself, the plant produces up to 5 q of ice daily, in moulds of 15 and 25 kg. The product is absorbed by the city market. It is an industry which, in the most substantial and most interesting part, is almost entirely in the hands of Italo-eritrean countrymen. C.I.I.A.O (COMPAGNIA IMMOBILIARE ALBERGHI AFRICA ORIENTALE). Headquarters in ASMARA. *ALBERGO C.I.A.A.O. - ASMARA It sprang up in 1937. It employs 8 europeans and 41 natives. The number of the rooms is 66 with 93 beds; each room in complete with bathroom and shower. It has a restaurant which can serve 150 meals at the time. Each room has its own telephone. In the hall there is also a television set. It is the only hotel authorized to exchange foreign currency. *ALBERGO HAMASIEN - ASMARA It sprang up in 1935. It employs 1 european and 6 natives. The number of the rooms is 40 with 71 beds. *ALBERGO C.I.A.A.O. - MASSAWA It sprang up in 1938. It employs 6 europeans and 33 natives. The number of the rooms is 61 with 99 beds; each room is complete with bathroom and shower. A section has been ceded to the americans with a contract stipulated as from 11.21.1958, renewable yearly. The restaurant can serve 250 meals at the time. It is equipped with a swimming pool and various gymnasiums. Besides the above mention hotels, managed by the C.I.A.A.O., the following other premises used as lodging-houses and boarding houses are existing in Asmara: *ALBERGO ITALIA - ASMARA Owner and manager is the countryman Menghetti. The hotel goes back to 1899. It has 35 rooms available, some of which are provided with a bathroom. The premise is supplied with restaurant, cafe' and billiards. It has 15 national and eritrean dependent persons. *ALBERGO ROMA - ASMARA Beyche Ghebre Street n. 4 Manager, since about four years, is the countryman Morandini Federico. It sprang up in 1914. It has 12 rooms with bathroom and shower available. It has 4 attendants on service. A restaurant is annexed. *ALBERGO-PENSIONE DIANA - ASMARA Avenue Haile' Selassie' n. 70 The manager is Mr. Bianchi Onello. The boarding house exists since about 20 years. It has10 rooms with bathroom and shower available. It has 4 dependents. It has a dining rooms for its own customers. *ALBERGO-PENSIONE VITTORIA - ASMARA Avenue Haile' Selassie' n. 54 Since about three years the countryman Zacconi Rocco is its manager. The boarding house exists since about 20 years. It has 16 rooms available, with bathroom and shower. It has 5 dependent attendants. The boarding house has also a restaurant-hall. *ALBERGO-PENSIONE BRISTOL - ASMARA Sebhatu Tesfamichael Street n. 2 It is managed by Mr. Massalin Domenico. The boarding house sprang up in 1941. It has 15 rooms available. It has 4 dependent attendants. *ALBERGO-PENSIONE ASTORIA - ASMARA Via Sacconi n. 14 Managed by Mr. Massalin Domenico. It has 8 rooms available, with bathroom and shower. It has 3 dependents at its own service. *ALBERGO-PENSIONE AUGUSTUS - ASMARA Via Lorenzini n. 5 Managed by Mrs. Trini Maria. The boarding house sprang up in 1940.It has 4 dependents. It has a kitchen service for its own clientele. *ALBERGO-PENSIONE IMPERIALE - ASMARA Avenue Haile' Selassie' n. 145 It is managed by Mrs. Menegaz Erminia. The boarding house exists since 1939. It has 11 rooms with bathroom and shower available. It has 3 dependents at its own service. It has a dining room for the clients. *ALBEGO-PENSIONE CENTRALE - ASMARA Via Carrara n. 11 Managed by Mr. Greco Filippo. It sprang up in 1939. It has 3 dependents. It has a dining room for its own customers. *ALBERGO PIETRO RULFI - ADI QWALA It is supplied with three or four rooms, for the eventual clients. Is has also a restaurant and cafe' service available. The premise is quite decorous and clean. *ALBERGO RISTORANTE "BELLAVISTA" - ADI UGRI It is managed by Mr. Bossi Enrico since 1942. It has 12 rooms available. It has 4 dependent attendants at its own service. ALBERGO SENAIT - KEREN The manager is the countryman Cangi Amleto. It exists since 1938, and it has restaurant and bar available. It has 6 dependents. The rooms with bathroom and shower are 8 in all. *PENSIONATO FEMMINILE - KEREN The countryman Aldo Maderni is the owner. It is managed by Mrs. Vecchia. It is a private villa, adapted to boarding house for families. It has 15 rooms available, comfortably grouped into small independent apartments made up of two or three rooms each. It is equipped with bathrooms and showers. It has a charming park available. *ALBERGO SICILIA - KEREN It is managed since 1935 by the widow Albergo Maria. It has 10 rooms available. It has 4 dependents. The premise is provided with a restaurant. *ALBERGO PATRIA - DECAMEHARE Managed by Mr. Pagotto Pietro since about three years. It is provided with restaurant-cafe' with billiard rooms. It has 15 rooms available with bathroom and shower. It has 6 dependents at its own service. *PENSIONE DRUSI MARIO - SENAFE' It is provided with 7 rooms. It has restaurant and cafe' service. It has 5 dependents. It was constituted in Asmara in 1938 for the tanning of hides and shoes production. The establishment, all covered by masonry and reaching an area of 200 sq m, has a monthly productive capability of 350 q of sole-leather and of 10,000-12,000 sq ft of chromium calves (vitelli al cromo ??) and tannin. It employs a working team of 7 italian specialists and 130 eritrean workers. The establishment has a potential productivity of 400 q of tanned hides monthly, but the product' sale is much inferior due to the internal market's crisis and export difficulties. The company's capital is of Eth. $. 350,000; the employed capital is of Eth. $.355,000; the annual business' volume is of Eth. $. 100,000. Eritrea holds 11 furniture factories of a certain importance (10 of which italian) and many other minor laboratories, these too for the main part italian. The yearly production, which is calculated to exceed, in value, Eth. $. 300.000, is for almost two thirds absorbed by the internal eritrean market; less than a third is directed towards other ethiopian centres and only a small percentage is directed toward Aden, Arabia and Djibouti. The eritrean furniture industry utilises mostly imported wood (from Italy and on a smaller extent from Scandinavia) and, only in small quantities, ethiopian and eritrean woods. An import movement of finished furniture is also existing, calculated around Eth. $. 70,000 yearly, of which about Eth. $. 60,000 from Italy. The most known italian furniture factories are the following: Sambrini, Ritorto, Varisco e Corbisiero, Satta, F.R.E.A.,Palma, Petrignani, Cianci, Paluzzi, There are also furniture importers, like Nastasi (from Italy), Calestrini (from Czechoslovakia), Valentini (from Italy). The latter imports exclusively chairs. The Society constitution's date goes back to 1940 and later to 1943. The head office is in Asmara with a branch in Addis Ababa and agencies in Djibouti, Khartum, Nairobi. The Firm started its activity in 1943 in order to face the alimentary situation, quite impoverished by the war period and for the lack of imports, soon establishing itself for the products' bounty and the accurate manufacturing. In the following years, besides the local consume, the firm had the opportunity to stipulate supply contracts both with the A.R.A.M.C.O. for Saudi Arabia as well as with the British Administration , then in Eritrea. So as to supervise better the increased production rhythm and with the purpose of getting in line with the most modern systems of european processing, the Firm transferred itself to new and larger premises, where it could modernly organize itself, importing from Italy all the necessary machineries, hence installing that which nowadays can be considered the most modern and best equipped Pork Factory throughout the Ethiopian Empire and the nearby Countries. Being and Industry typically based on the processing of raw materials grown and bred locally (swines and bovines), whose production requires a particular care and selection, is has been necessary to make own breeding sites distributed in different zones of Eritrea. Presently the Industry has available over 1,200 swines and 200 bovines which follow a periodic cycle of felling and of regeneration. Since the above mentioned property cattle does not, on regeneration, satisfy the total request for swines, the Industry avails itself also of other local breeders while for the bovines if avails itself of Asmara's Market. The Salumificio's products are mainly based on the typical italian production. Two thirds of the local consume are today covered by the Salumificio's products. The sales organization is in a position to provide to the supply of all the centres of the vast Empire, so that the products which are to be found at Asmara and in Addis Ababa, can be found also at Dire Dawa, Harar, Djimma, Gondar, etc. 50% of the production is also exported to the nearby countries, such as Aden, Djibouti, Khartum, Nairobi, utilizing mainly - for these shipments - air services. Completing the products of its own production and with the purpose to satisfy the clientele's requests, the Industry has also taken up the sole agency for the marketing of the dairy products of the Casciani's Dairy Factories of Elaberet and of the Zootechnical Consortium of Asmara and, so as to have a quite complete assortment in so far as cheese is concerned, it also imports from Italy several typical products, not manufactured or produced locally. The Industria Miele Milani (created in 1941) has two fundamental merits: that of having been the first industry of the kind in the territory and that of having reached, after a long experimental phase, the demonstration of the optimal possibilities existing in the country for a rational apiculture. This activity can be considered to have been founded about two decades ago by the apiculturist Pietro Milani. After about eight years, that is, after having acquired a personal experience concerning the real possibilities offered by apiculture, the old apiculturist started a rational breeding which required novel methods due the climate's diversity, seasonal cycles, bees' behavior in their nutrition, in their development, in their reproduction and in their diverse attitudes: for which the italian experiences of Mr. Milani served just as a basis to a study and to an absolutely different adaptation. As a matter of fact, the apiculture of the eritreans, prevailingly practiced in the zones situated at a medium altitude - that is, at least at 1,000 metres below Asmara's altitude - retains the ancient character of family breeding with a scarce and low-quality production of honey; production which had dissuaded whoever else dedicated himself to this type of activity. Instead, after three years of researches and experimentation, the Industria Miele Milani succeeded in obtaining as much as 190 kg of honey from two families of bees: more than a record production if it is considered the european average, notoriously of 20-25 kg per bee family. To reach these results the apiculturist has, among the other things, created an all-special beehive, thicker in the wooden partitions, and smaller than the standard ones used in Italy and elsewhere. This special beehive is able to attenuate the effect of the sudden temperature's variations and, with the so-called hot-honeycomb internal arrangement, it gives an almost constant ambient's conditioning, even in the night and during the rigid winters. New life conditions, to which, by groups the bees have been educated, have been created. Their nourishment has been directed toward the eucalyptus' flower, abundant in the highlands from January to June, and hence suitable to give a constant type of production, while from July to December, as here the bees do not undergo lethargy, the nourishment is directed toward a selected seasonal flora. Once reached a constant production, of optimum quality and with several hundreds of beehives, Pietro Milani has moved over to the commercial organization for selling the honey, the liquid one in jars and the solid one in loaves and canned. This marketing has gradually taken over the internal market with particular reference to the european consumer, formerly forced to mistrust the local product, unrefined, not centrifuged and with a distasteful smoke' smell. After another period of experimentation, in 1954, the Industria Miele Milani could introduce in commerce other two products: the hydro-honey, alcoholic beverage rated at 11o, of an agreeable taste and similar to the "marsala" wine under many aspects and to the local "tec" for some other aspects; and the "Gele' Royal", the energetic cure, among the most efficacious, which has been experimented by several hundreds patients with immense benefits. In the Industria Milani pollen too is gathered, requested in Europe by many firms for the manufacture of cosmetics besides than for nourishment, as the pollen contains a remarkable quantity of vitamins. The same Industry is also equipped for the manufacture of implements for apiculture. Born in 1941, with an installation partially fabricated in Eritrea, so as to face the population's needs in the war period, the Centrale del Latte has continually improved and developed its own installations, with the purchase in Italy, England and Germany, of modern machineries (pasteurizers, freezers, bottle filling machines). From the Centrale del Latte, which works through a municipal tender and which is supplied by the Eritrean Zootechnical Consortium, 4,500 l of pasteurized and bottled milk are produced daily, directed mainly to the centres of Asmara and Massawa, to the hospital and various institutes while the remnant goes to the Kagnew Station for the american personnel on duty in Eritrea, for whom as of recent a purchase contract has been signed. On June 1st the Centrale del Latte, by now with its new equipment and very modern installations, has been visited by HE the Chief of the Government of Eritrea and by the country's major authorities. The Centrale del Latte, which gives work to about 40 workers and 5 italian technicians, has own transportation means and workshop. Constituted in 1950 from an older company, this Society by now linked with the vaster commercial organization of the Fratelli Casciani, in particular dedicates itself to the production of fish-flour for fodder and, an a minor scale, to the gathering of the "trocas" and of the mother-of-pearl. All of this Firm's production is exported to the markets of Germany, Switzerland and, in greater quantities, of Israel. The fish-flour of the S.A. Mar Rosso reaches a yearly production varying between 20,000 and 30,000 q, as related to the results of the fishing season which lasts from 6 to 7 months. The Society employs - besides that, indirectly, numerous fishermen which supply it of raw material - about 70 eritrean workers and 3 italian technicians. Constituted in 1944 for the working of "trocas" and mother-of-pearl buttons, the Society has available a productive capability of 30,000 gross, actually reduced to 7,000. The workers employed reach the number of 70. During full working potential the establishment employed up to 250 workers monthly. The employed raw material (trocas and mother-of-pearl) is fished exclusively in the Red Sea by a fleet of fishing boats (sambuqs), which altogether give work to about 1,000 eritrean fishermen of Massawa. The buttons' industry in Eritrea has so perfected itself so as to reach the point to be able to compete with the european industry. The capitals of this industry are entirely italian. However, this product is not easily marketable for a complex of economical factors insidious toward the production's development, besides the competition of similar and more economical products, even if of an inferior quality. *ALUMINIUM WORKS - DITTA AMBROGIO DRAGHI - ASMARA This industry has a notable production for objects for domestic use destined for the greater part to the eritrean consumer's market itself. It has a press for the manufacturing of pans of various sizes; some lathes for the production of templates and a small foundry department. It gives work to about 20 eritrean workers. *FABBICA DI CHIODI - F.LLI TEODORO AND FRANCESCO MAGNOTTI - ASMARA Born in 1942 for the manufacture of welding electrodes and afterward of nails, with chance machinery and recovery materiels. With the upcoming of the Eritrean-Ethiopian Federation and the ensuing imports freedom, the Ditta Magnotti found itself in need of improving its production so as to face the foreign competition which offered an undoubtedly better product. The machinery, purchased in Italy in 1956 and of a total cost of about Eth. $. 100,000, includes a wire drawing machine for working the wire rod coils in the desired diameters and 12 machines for nails production of various measures: from 1 to 15 cm, with a production which varies from 550 to 180 pieces per minute, depending on the size. The total production is of about 500 q monthly, 440 q of which directed toward the Addis Ababa market and 100 q to Asmara's market. The workmanship in the factory is all eritrean. 80 workers are employed who carry out continued turns throughout the 24 hours. Besides the factory has its own electrical supply voltage transformation cabin, and italian machinery for the production of packing boxes which are obtained from eucalyptus trunks. On the 29 July 1959 the Chief of the Government of Eritrea visited the Fabbrica di Chiodi Magnotti and addressed to the industrial owners "warm words of gratitude and encouragement - so as reported by the official print organism of the local Government - for that which they had performed by creating an industry unique in all the Ethiopian Empire". *S.A.R.I.C.E. - SOC. AN. RAPPRESENTANZE INDUSTRIE COMMERCI ERITREI - ASMARA The Society' seat and the industrial installations are on a plot of land of about 2,850 sq m. The Society has available a section for processing tin plates, a section for canning alimentary products, and a products' warehousing and shipping section. The section for working the tin plate is equipped with all the machineries, and other articles (splitting, cropping, roller, side seaming and spilling machines; presses, pivots, punching machines, etc. ), for transforming tin plate into cans The canning section is made up of a freezer cell, a shearing machine (spolpatoio ? ), a heater's room. The warehouse section includes large premises for the preservation of the products, for preparing the boxes and for strap binding. The value of the installations is of about Eth. $. 130,000. The factory can produce from 4 to 5 thousand cans of meat and an equal amount of other products during a working round of eight hours. *E.M.C.O. (YE ETHIOPIA MEGHIB CO.) - ASMARA The employed capital is of Eth. $. 210,000. The productive capacity ranges from 9,000,000 to 10,000,000 cans annually. The dependent personnel includes 6 italians and 150 eritreans, in the active season. In the meager months the workers reduce to an average of 80. The whole processing is carried out for on behalf of the A.C.S.A.L. ( Azienda Carni Societa' An. Lissonese) of Lissona (Italy) which sends the empty cans, the card board boxes and other necessary raw materials, all in temporary export. The Ethiopian (dovrebbe essere Eritrean Federal Government !!!) Federal Government releases the temporary import permits through a security deposit. *FABBRICA SAPONE - LORENZO FANTOZZI - ASMARA Since its difficult inception this interesting industry slowly, but progressively, transformed itself so as to present itself nowadays at a level of high commendation not only for the laborious owner, but for the territory's economical life as well. The product which the factory can nowadays place into the market - not only the local one - has by itself all those merits which make of it a soap greatly appreciated and of wide consume. Besides all, the vast number of eritrean workers which the plant can absorb must not be forgotten, and this is a further merit of this industry for the advantage of the local populace. On July 31st of the current year the plant was visited by the Chief of the Government of Eritrea, who expressed his own admiration for this further work of the italian labour. *"LABORATORIO ARTIGIANATO ERITREO" - RUGGERO RAVASINI - ASMARA The owner is holder of the licence "Jewelry - Goldsmith - Watchmaker" shop and laboratory and of the artisan licence " Eritrean Artisan Laboratory". The sale premises, now compounded in a single shop, are at n. 32-34, Avenue Haile' Selassie'. He dedicates himself to the artisan workmanship of gold and silver since 1945 and he gave an impulse to the creation of objects of local style, suitable to the request of the international tourism. Expert of oriental pearls, with the cooperation of Ali Nahari of Massawa he dedicates himself to the gathering of the Read Sea pearls which on the european markets are considered among the most beautiful. The Eritrean Government has willed to give him a recognition for his merits by entrusting him with the task of Eritrea's gift to H.I.M. the Emperor on the occasion of the Silver Jubilee: a gold and silver equestrian statue of the Sovereign. Since 1965 Mr. Ravasini manages the "Eritrean Artisan Laboratory" where also prized woods, ivory, horns and mother-of-pearl are worked. Among the woods, in the first place, Eritrea's wild olive, which is gathered from the trunk died trough old age for hundreds of years, an heavy wood, of compact fibre and aesthetically beautiful. He has introduced into this type of work the porcupine's bristles, obtaining ornamental items of a beautiful effect, by now known as characteristic only of Eritrea. He taught to exploit, for decorative ends, the hippopotamus and the wild hog's tusks and among the prevailing objects are to be remembered candle-holders, gongs, cigarette lighters, paper cutters, etc. He gave a start to the cutting of the hard rocks - agate from the Danakil Country. It is the only eritrean firm specialized in the collecting and valorization of typical local objects. *INDUSTRIA MAGLIERIA - ASMARA The Industria Maglieria di Asmara was born about five years ago through the enterprise of the actual administrators, Messrs. Bruno Panesi and Domenico Gargano, the former caring for the administrative part and the latter the commercial organization, the purchases, the production and the sales. The initial difficulties overcome. thanks to the two administrators' tenacity and with the investment of a conspicuous capital, Asmara now vaunts another useful industry, whose production has nothing to envy to the competition's articles, be they locally manufactured or imported. With six old-model machines and eight workers, this industry started to work, as we have already mentioned, five years ago. Within this few years, the machinery equipment has become modern. As a matter of fact the Firm now has available 45 knitting machines, 6 coil winders, 15 refinishing machines, 1 automatic ribbon machine, two vapour mangles. The manpower reaches a total of 130 workers and clerks, and 66 girls are included among the workers. The daily production is of about 220 finished pieces (that is, pullover garments, jackets for men and women, clothes, overcoats, "Juliet and Romeo", children's whole garments, etc. ), which brings the total to about 5,000 pieces monthly, in a wide range of colours and designs. The Firm is planning the construction of a modern industrial plant, rationally elaborated so as to quicken the services in favour of the production. For this purpose a plot of some thousands sq m of land has already been acquired, where within a short time the starting works for the building's construction will start. In the future activity's program the production's increase, which is requested not only by the Ethiopian Empire, but also by other countries such as Sudan, Kenia, Rhodesia and South Africa, is prospected. The Chief of the Government of Eritrea has visited the Panesi - Gargano factory during the last month of August, with eulogy to our two countrymen for the praiseworthy activity which they carry on. *I.F.A. - ISTITUTO FARMACOTERAPICO AFRICANO - ASMARA The Society avails itself of an establishment in Asmara and of another in Massawa; the first for the production of medicines, while instead the second is used for the production of fish-flour, shark's liver oil and of all the other by-products of fishery. It has a social capital of 30,000 sterlings. The medical products are marketed in the internal market, while those from fishery on various foreign markets (North Europe, Middle East, Ceylon, Congo, Italy). *ETHIOPIAN ENGINEERING DEVELOPMENT LTD. - MASSAWA - Following the association of the two Societa' Anonime, Impresa di Costruzioni Sebastiani and Cantiere Navale Sebastiani, the "Ethiopian Engineering Development Ltd." ensued in 1955, with the purpose to continue the work of the ceased Societies, which had already affirmed themselves in the field of naval and maritime constructions. Head of the Society is the countryman Eng. Aldo Brunello and it has the purpose to supply assistance to the ships in the harbour, offering an optimum naval yard. Indeed E.E.D. is in particular suitably equipped for mechanical constructions related to its own specialty, for the installation and revision of fixed and nautical Diesel engines, for the construction of harbours' and industrial installations. Its own organization allows it to deal out a precious assistance to those ships in transit at Massawa. The social capital is of Eth. $. 35,000. The employed capital is of Eth. $. 250,000. The annual business volume is of about Eth. $. 500,000. The number of the employed european workers if normally of 15 persons while that of the eritrean workers is, on the average, of 60. The following can be particular reference data: actual hauling capability: up to 600 ton displacement; average ships repaired every year: n. 18; equivalent SL (SL abbreviazione per ???) 6,500 ton; the ships provenience is disparate: the Yard serve ships of Ethiopia, Sudan, Saudi Arabia, Yemen, Israel and other fleet in transit at Massawa harbour. The society is planning the building of new workshops and of a dry dock for ships up to 2,000 tons tonnage. *TYPOGRAPHICAL INDUSTRY Various are the typographies of property of our countrymen in Eritrea. Undoubtedly the most important is that heading to the "Societa' Anonima Corriere dell'Eritrea" which publishes, among other things, the daily newspaper "Giornale dell'Eritrea" in the italian language. *CINEMA AND THEATRE INDUSTRY Although this industry has suffered a remarkable contraction and a tangible functional receding adequate to the moment's necessities, it can however be affirmed that the premises used as cinemas' show-rooms and for public entertainment - almost all property of our countrymen - are modernly equipped and they meet, under every aspect, the necessities of the public more politely exigent. Following is the list of the cinema halls, managed by italian societies and enterprises: Cinema "IMPERO" - Asmara Cinema "ROMA" - Asmara Cinema "CROCE ROSSA" - Asmara Cinema "CORSO" - Massawa Cinema "IMPERO" - Assab Cinema "IMPERO" - Keren The italian societies distributing the cinematographical films in Eritrea are the following: ASTRA (Asmara) and GENOFILMS (Asmara). *ITALIAN COMMERCE INDUSTRIES We have already hinted at the economical crisis which Eritrea is traversing. It is worthwhile, here, to recall that which the President of the local Chamber of Commerce, the countryman Raffaello Mangani - in the Members' General Assembly of 27 March, 1960 - has related concerning the Country's economical activities, in balance seat for the exercise January 1st - December 31st 1959: "The new Government's decrees of the State Bank of Ethiopia, enforced on September 1st, 1959, which exact the down payment of 100% of the value of the single orders at the moment of requesting the currency exchange permit for numerous categories of import merchandises, have caused a remarkable contraction of the import's commercial dealings. These dispositions have stressed the already existing obligation for the importers not to place any order for goods before obtaining the pertinent import permit, a condition which was, until September 1st, very loosely applied. In virtue of the new restrictions, the State Bank has cautioned the importers that such condition would have been literally applied, with no annulling possibility, and henceforth, all the goods arrived at Massawa or embarked priorly to the date of the release of the import permit, would have been rejected and returned, together with the embarkation documents, to the supplier. The Presidency has engaged itself concerning the numerous cases brought forward by some importers, whose goods risk to be rejected as they are not in order with the import permits. The long conversation exchanged with the Bank's Managers and the attempts to obtain a legitimation (sanatoria ?? ), at least for a part of those cases for which the reasons for non-compliance presented some sort of justification, haplessly have not brought to any favourable result, given the absolute and uncompromising instructions received from the higher competent Authorities of Addis Ababa. Other dispositions issued in the same period have also excluded from the release of the exchange currency import permits some foreign commodities of normal consume. From the reports of the State Bank of Ethiopia, published in the months of September and November 1959, is indeed evident that the ethiopian currency reserves have sustained a pointedly marked reduction, whose main cause is to be sought in the reduction of the coffee's price on the international markets. From the published data it appears that during the last two months the price has fallen from 50 to 35 cents of US dollar per pound which, calculated on an annual average of 41,000 tons of crops, it signifies a yearly loss of about Eth. $. 34,000,00. It must be noticed that, during these last years, from a fifth to one eight of the custom duties consisted in customs' proceeds from the export of coffee. The disconfortable situation, due to this loss, has been softened, until February 1959, by the State Bank of Ethiopia which has managed by withdrawing from the reserves of foreign currency for an equivalent amount of Eth. $. 25,000,000. Between 30 June and 30 September the reserves have further diminished of Eth. £. 15,000,000, - in a greater measure in respect to what happened during the same period of the previous year - and it has been the too fast and continuous reduction which, as from what appears from the reports of the State Bank, has made necessary the measures suitable to stop the output of foreign currency. These are the reasons adduced for the restrictions actually enforced, which logically have caused the strong contraction of the import trade. As for what concerns the traders, the deposit of 100% - or more - of the goods' value at the moment of the release of the import permit, has strongly shaked all the category, because the movement of the single capitals has been limited in such a way so as to markedly reduce the imports' volume. Hence the solution has to be searched for in the direction to give to agriculture, which of necessity will have to forcedly direct itself toward new products to forward to the export, so as to be enabled to support the unfavourable leaning of the coffee market. It is perceived that, for some export goods, the transportation cost from Asmara to Massawa is seen to be higher than the cost of transportation from Massawa to the mediterranean ports, with the latter including also the transit rights through the Suez canal. The activity of the export marked as compared to 1953 has shown a greater movement. It is indeed evident, from the State Bank's data, that, in respect to 1958 Eritrea has exported in 1959 over 7,000,000 dollars more. This is really reassuring because the increasing growth of the exports will give a sound contribute to the solution of the serious problem, already hinted at, of the foreign exchange."